Welcome, friends! We know why you’re here. You’re almost at the end of your Christmas shopping ordeal, we mean experience, and you are nearly there. Armed with bags of ‘stuff’, you have emerged from the trenches of the High Street more or less in one piece. Bloodied and bruised but unbroken, you are ready to call it a day and head home triumphantly to put up the tree. But! You still have that niggling feeling! All the ‘big things’ are taken care of but you want your guitar playing loved ones to have extra, smaller things to unwrap and open up on the big day. Heart sinks. Panic sets in. Anxiety takes over. Stop! Don’t worry! You’re going to be okay. Why? Because your pals at guitarguitar have put together this handy blog to guide you towards some Seasonal small buy wins! With this blog, you will not fail! Check out our carefully curated selection of delectable stocking fillers (many, but not all, will in fact fit inside a large stocking) and choose some great gifts for the beloved Rock Star in your life! This list contains some essentials, some great value pedals and even an entire instrument! Prices range from a couple of quid to just under £50. Read on and feel smugly prepared! First up, let’s look at a couple of tuners. Yes, a tuner is always a sound purchase for a guitarist or bassist. Even if they have one (let’s hope they do), it’s often at the rehearsal room or tidied away in a gig bag. A fresh new tuner at a great price is an easy route to the heart of any musician. We have two for you today: one is a pedal for the floor and the other clips on to the headstock. Both have their merits! The Snark is a small, handy tuner that clips on to any part of the instrument’s headstock and senses the note frequency through vibrations in the wood. It’s small, it’s accurate and the batteries last for ages. This little red chap is used on stages across the world. It's a deservedly popular item and every guitarist and bassist can use it. 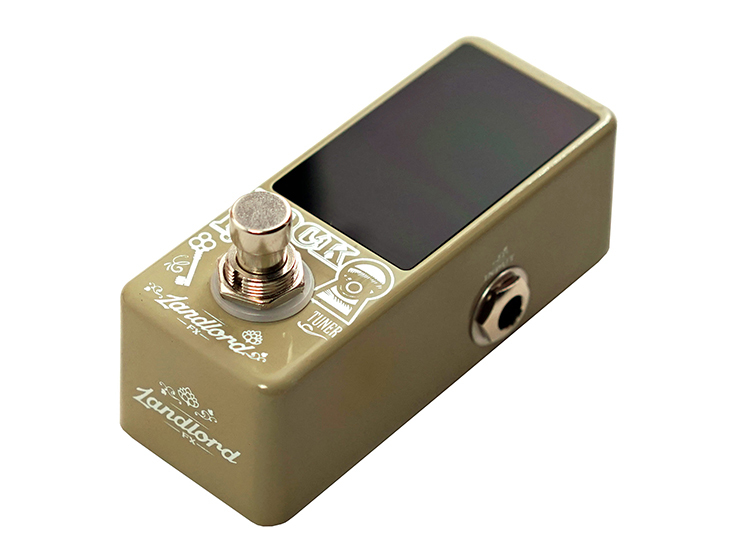 Our next tuner is from new pedal brand Landlord FX. 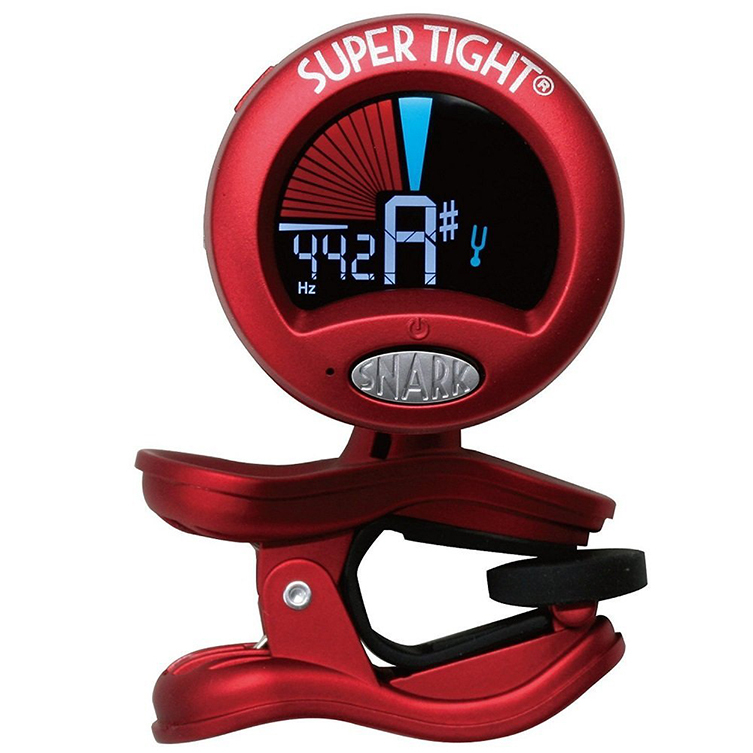 The Lock In tuner is a compact pedal tuner with a large, bright display. It’s chromatic (as is the Snark) so it can handle alternate tunings and it is as solid as a fortress. Best of all, the price is scandalous! We can see this being a number one seller for tuner pedals. We hope we’ve bought in enough to last until after Christmas but our advice is to get in quick! The Landlord FX Lock In Tuner is an absolute steal. This is one of those things that every musician knows they should buy but often don’t get around to. Come gig time, these tools prove their worth time and again. This handy little guy has enough screwdrivers and allen guys to get your pedals opened up, your strap buttons tightened and all manner of other tweaks and jobs that are required for a smooth playing experience. No more fruitless sifting through the toolbox under the kitchen sink! 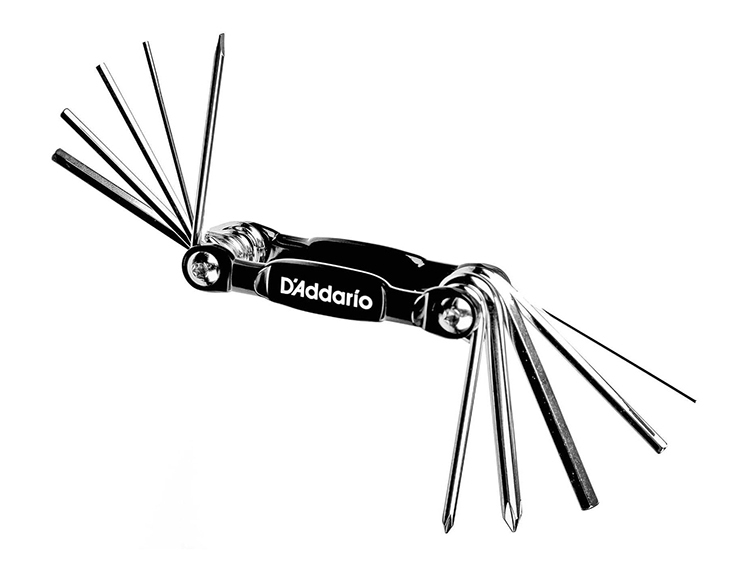 There are ten tools on the D'Addario Guitar/Bass Multi Tool, in both US (Imperial) and Metric sizes. It’s tough, long-lasting and an excellent gift! Straps are an excellent way to express a little of your personality. Some people prefer to opt for a plain black strap and fair play to them! But if the musician in your life is a little more extrovert (or you feel like their on-stage wardrobe could do with a little more colour…) then check out these absolutely stunning straps by Dunlop! They are a limited-edition collaboration with cult graphic design collaborative ILoveDust and we think they totally hit the bullseye! There are six designs to choose from. We love these! Looping has taken off massively in recent years. Even six or seven years ago, it was seen as relatively avant-garde and ‘fringe’ but nowadays, it’s a regular occurrence on most guitarist’s pedalboards. 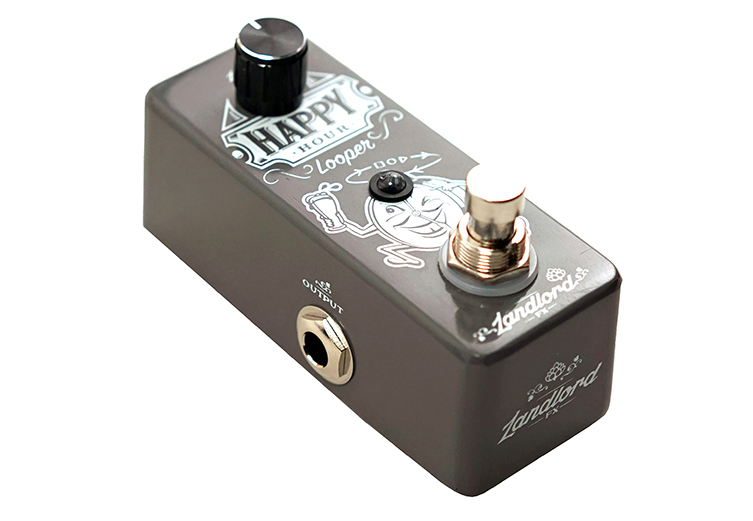 Now it’s easier than ever to get in on looping with a pedal like the new Landlord FX Happy Hour looper! This little guy may look unassuming but there is a massive available looping time of 10 minutes on here! Play, record, loop, overdub, all with a single footswitch! It also has USB connectivity and a True-Bypass switch, both of what are astounding features at this price! Don’t forget to grab a power supply if you are going for a new pedal! 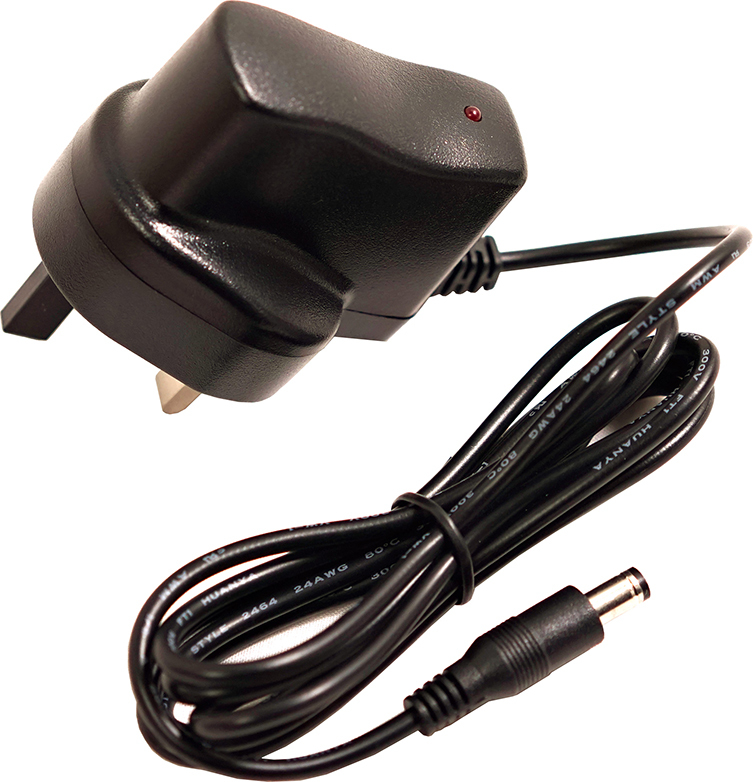 Tourtech are a company who supply accessories for gigging musicians and this 9V supply is perfect for powering all standard stomp boxes. That means Landlord FX but it’ll also work for BOSS, MXR, Fender, Ibanez and almost all other brands! Power supplies are the classic thing that always goes haywire at the worst possible moment (like right before a performance) so give your beloved musician so extra fight by gifting them this handy spare for their gig bag. Strings. Every guitar player has their preference for sure but we’ve noticed over the past year that almost every player who tries out these D’Addario NYXL strings overwhelmingly tend to stick with them! NYXL strings are made from a high carbon steel alloy for significantly greater strength. To you and I, it means they hold their tuning much better than standard strings and also feel great under the fingers! 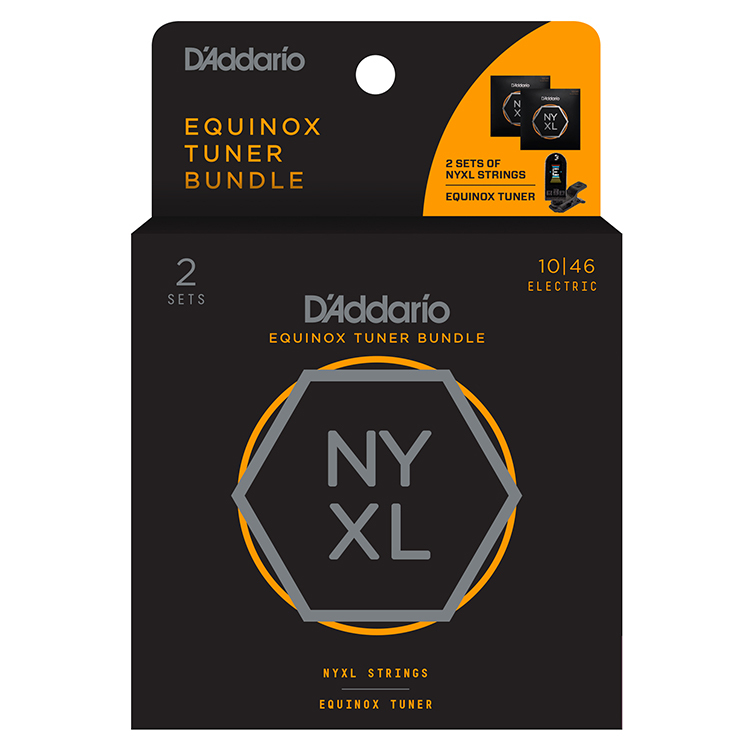 These special packs contain two full sets of D’Addario MYXL strings AND a Planet Waves Equinox clip on tuner! Deal! The pack is available in two gauges: 9-42 (pretty light) and 10-46 (most popular choice). Fresh strings sound far better and are also more healthy for the guitar (corrosion etc kills frets like a medieval plague) so these are a no-brainer. On the subject of looking after the guitar, this attractive boxed set from Dunlop will be a welcome addition to every guitar and bass player’s Christmas stocking. Inside the box you’ll find three bottles: the famous Formula 65 polish which cleans the guitar body thoroughly and smells magnificent; the 65 Ultimate Lemon Oil for giving your guitar’s fingerboard a drink; and the Ultraglide 65 String Conditioner for helping to wipe away filth and grime from your strings. No more Bubonic Plague! 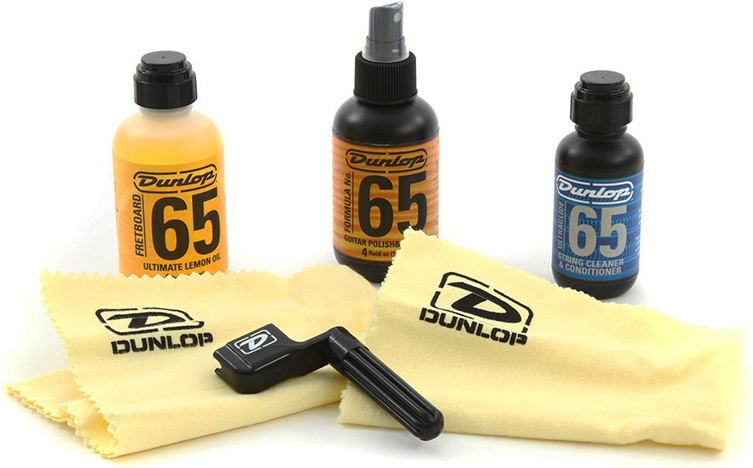 Not only that, this boxed set contains two Dunlop polish cloths and a pegwinder to help speed up re-stringing. 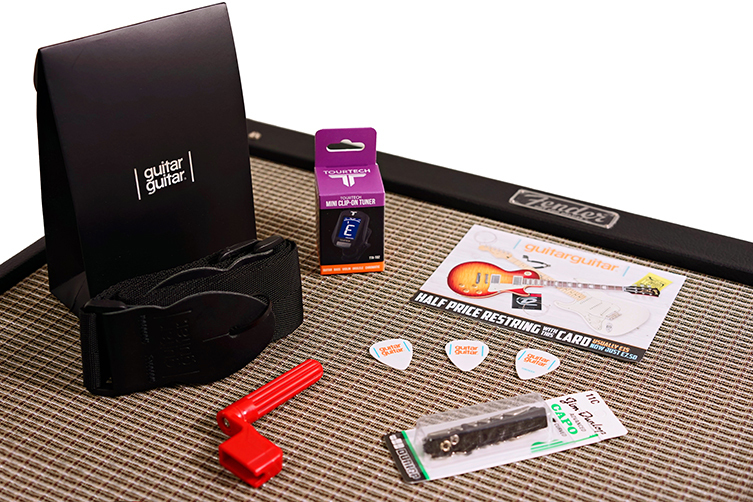 Here’s a slam dunk of a purchase for you: the guitarguitar Standard Gift Pack! We’ve put this special package together ourselves, choosing each item for quality and value. 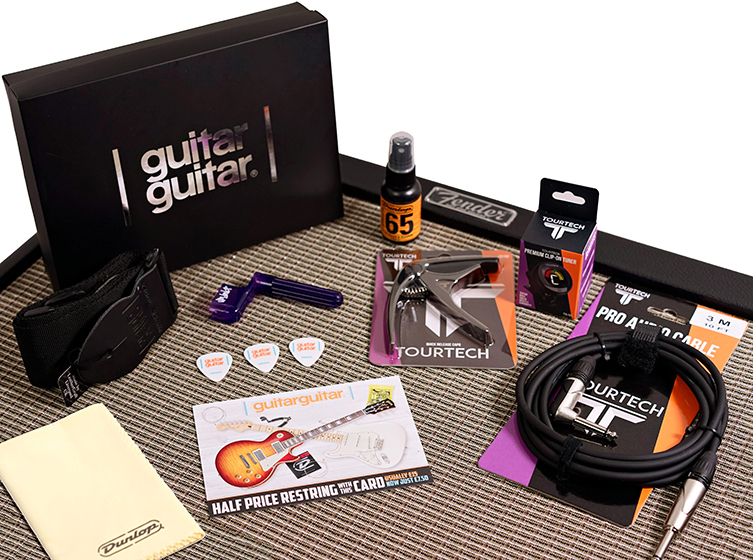 Inside the lovely black package, you find the following treats: a Tourtech clip-on tuner, a guitarguitar branded black webbing strap, a Dunlop 11CD capo, a Stagg string Winder and some guitarguitar plectrums! The value is outstanding here so if you are not sure what accessories your loved one needs, grab this awesome pack! A Premium gift pack is available too, with an upgraded capo, cable and more, all in a deluxe box! Some of the items from the Premium Gift Pack would make great stocking fillers in their own right. We’re thinking of the Quick Release Capo and the TTIC-N3PLR Cable. 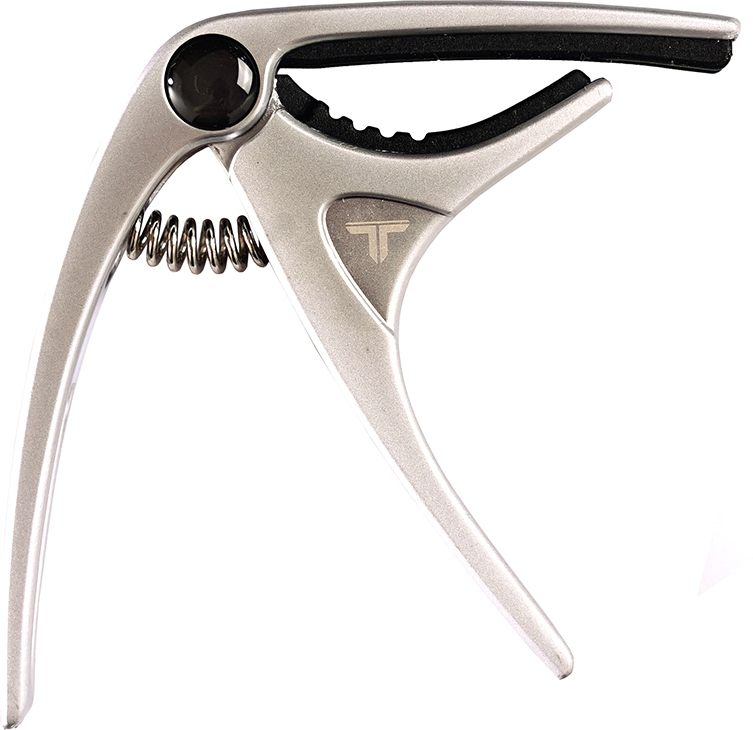 The capo is available in both Silver and Black, can be used one-handed and fits snugly to electric, acoustic and 12 string guitars. Another thing that any guitarist or bassist can never have too many of is plectrums! Many plectrums exist but it’s a particularly safe bet that every musician has used a Dunlop pick. They dominate the market, for the good reason that they make brilliant plectrums! 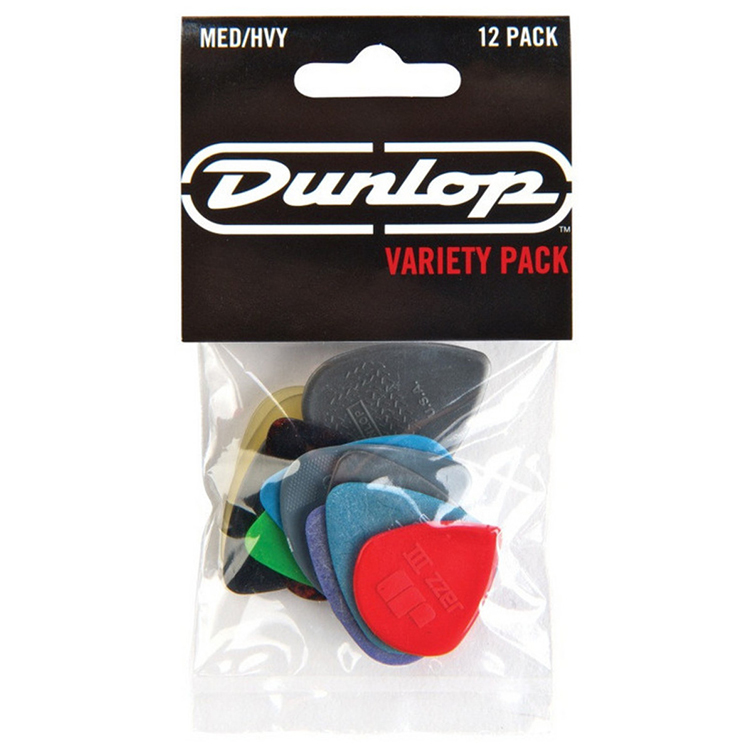 They do make loads though, and you may well be unsure which type is preferred by your intended giftee so play it safe and grab one of these great Dunlop Variety packs! Each pack has 12 different plectrums in different thicknesses. You have a choice of Light/Medium or Medium/Heavy for the assortment. We’d suggest the Light/Medium pack for guitarists who often play acoustic as well as electric and Medium/Heavy for players who are proficient lead guitarists. Bassists most probably want the heavier set, too. This is an easy, thoughtful and inexpensive gift that will always go down well. Lastly, we’ve included an entire instrument. It’s inexpensive, fun and also stands half a chance of fitting into a stocking! It’s a ukulele! Mahalo make great ukes in all sorts of fun colours. Ukes are easy to pick and and play. People who already play guitar will have no problems with a uke at all! 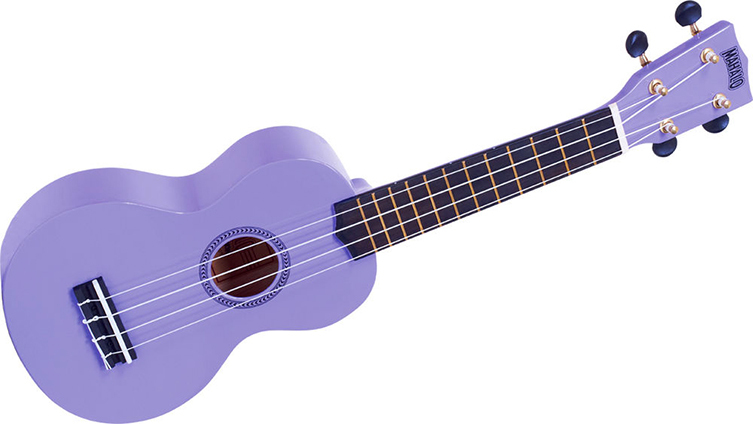 We have the Mahalo MR1 ukulele in a broad rainbow of colours like purple, blue and pink so there is plenty of scope for choice. 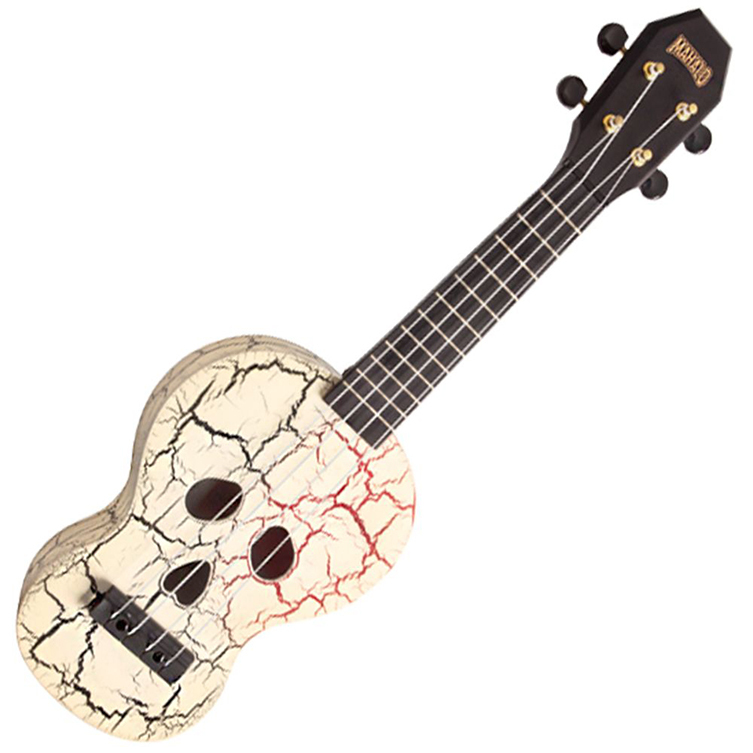 We also have the awesome Mahalo 2520SKWH which is a uke shaped like a skull! The skull’s mouth is the bridge and its eyes are the soundholes! Amazing! The headstock is even shaped like a coffin! We want! That brings us to the end of our stocking fillers shopping list. We hope you’ve found some inspiration here: we want to make things easy for you during the Christmas mayhem! We’re always here for you if you need more help so don’t be afraid to get in touch either in our stores or online. From all of us here at guitarguitar, we wish you a Very Merry Christmas and a Happy New Year!